I’m on a spinning wheel. Wheeee! After two months of practicing on drop spindles, this weekend I had the opportunity to try my first spinning wheel. Willie Wheelie, a very welcome guest in my home. He arrived Saturday evening. I’ve spent nearly eight of the last 24 hours learning how he ticks. It’s a Louet S75, borrowed from a kind friend who is looking to find it a new owner. Boy, am I a sucker. My friend must have known that once I got my hands on my first wheel I would fall in love. It’s like a first boy friend. A first kiss. There might be a better wheel for me out there, but after the thrill of touching this one, it’s hard to imagine feeling this way about any other wheel. The first hour or two with Willie Wheelie were very frustrating. 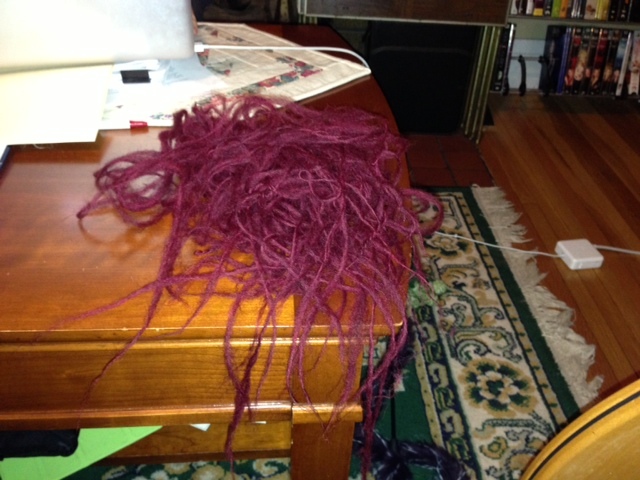 He didn’t want to play nice and kept jerking the yarn out of my hands. Not coy. More like a 10-year-old crush punching me on the arm and running away. All the technique I learned using a drop spindle flew out of my head. Heck with the 10-year-old crush metaphor. It was like trying to lasso a very small weasel. Eventually, I figured out how to adjust the wheel so that I could capture the weasel. Then the drop spindle technique started to come back. I was able to spin in short spurts. Eventually I figured out that I needed to treadle backward a bit to get to a more stable bit of the spun fiber, before attempting to treadle forward again. I was beginning to learn its wily tricks. Not totally pretty, but definite progress. The worst parts are hidden in the center where you can’t see them. Why did I feel compelled to get all this spinning done right away? Other than the fact that I tend to get obsessed with pretty new toys like this? Next weekend I’m attending a spinning party. There will be lots of more experienced spinners there. I’m going to get someone to teach me how to ply. Who knows, I might get some usable 2-ply out of this endeavor. Previous Good things come to those who wait. Knitted things. Next Lewis Carroll Was Here: Diz, niddy noddy, and other crazy spinning words. Aaaaah, I’m so jealous! I’ve been wanting to get a wheel for a little while and that one sounds fabulous! I hope you have a great time at the spinning party, too! I really want to get myself to try a few other wheels before I settle. We’ll see if that happens. Hopefully at the spinning part I’ll get a chance to try a few others. Yaaaah!!! I am loving this so much! It is so exciting learning how to spin. 🙂 I can’t wait to see your 2-ply! At the moment I’m using the very slowest year on the wheel. The fact that I can put the band on a smaller notch on the bobbin and make it go that much faster scares the crap out of me right now. Q – Yeah! Nothing like a wheel. 😎 You’re blogs crack me up! Thanks!!! I was hoping you’d say that. Not that I can’t learn how to ply on my own, but I think it would be more fun to have you show me. Just about everything else has been self taught. I don’t think I have any real notion of what I may be doing right or wrong. I’m so jealous! I’ve only ever spun on a spindle a d found it tedious. I have a feeling of I sat down at a wheel there’s be no going back. 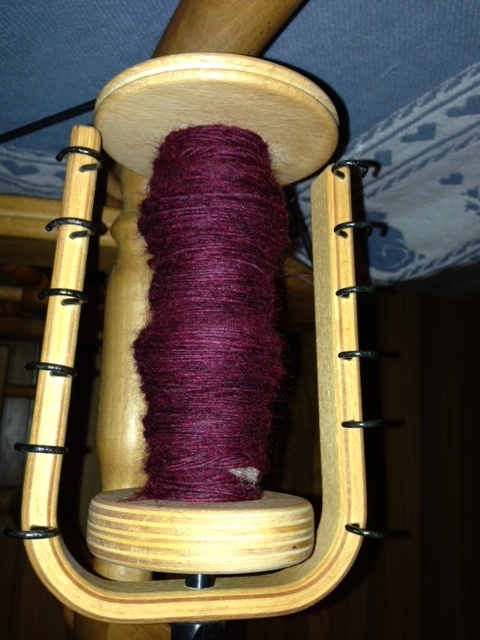 So far I’ve really enjoyed my spindle spinning, but it’s certainly not efficient, compared to a wheel. But it’s so portable. I’m really looking forward to my first time taking my drop spindle to the airport. Jealous! I’ve really been wanting to get back into spinning, but all I have right now is a drop spindle and a kitten who thinks that’s a really fun toy. Definitely try other wheels before you buy! There’s no saying you won’t come right back to Willie and the fact that he’s coming from a friend so you have someone to go to for help is a definite advantage, but try some others first because the right wheel will sing to you when you find it. If it’s Willie, awesome, but if it’s not, at least you have him to learn to dance with! Wheels are lovely and the Louets are good dependable spinners. They are bobbin-led which means they have stronger tension and adjusting that to the right setting can be tricky. (Which I just learned this past weekend in Taos, helping a friend with her new Louet. 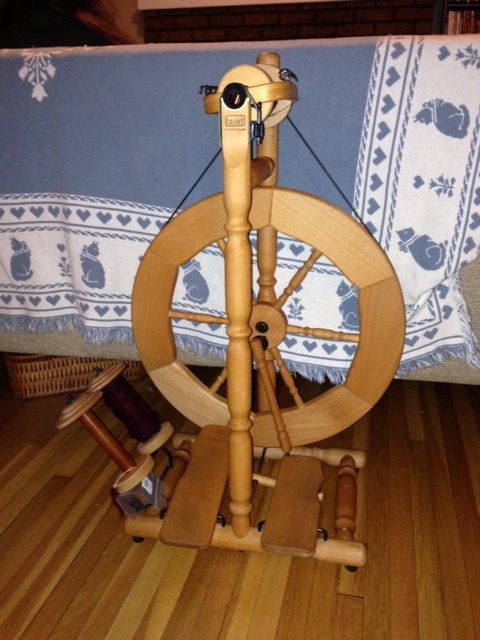 I am an experienced spinner but hadn’t ever spun on a bobbin-led wheel. With spinning there is always something new to learn). Plying is super-easy because there’s no drafting. There are lots of YouTube videos to help you get started in case you can’t wait until your spin night. Well done! Spinning your own yarn adds a special element to the knitting ! I would like to learn with a spindle as perfect for travelling. A spinning party sounds excellent, can I come too? If you live in Southern MN, you could conceivably make it. I vote for smarter and faster. Thinking about taking up spinning myself. Thanks for reading! All I can do is ooh and aaah. Looks like you’re living my dream. Anyone would lend me a spinning wheel? Jealous! 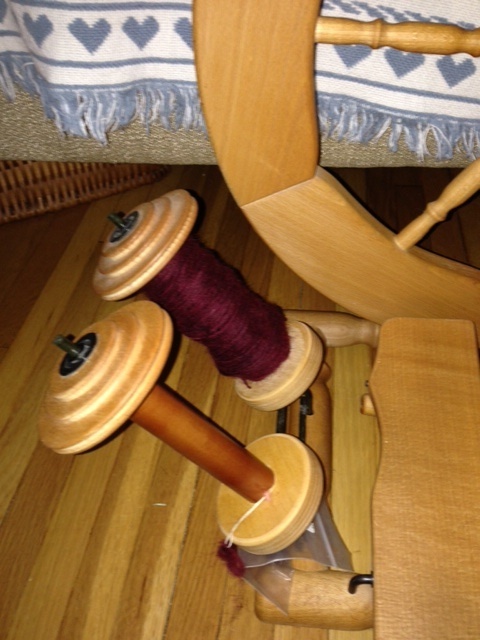 I always lose interest in my spindle before I get a full cop because it’s slow, plus I get tired of standing to spin. I feel like a wheel might solve that, but I’ve never had an opportunity to actually try one out. I usually spin on the spindle while sitting on the couch watching tv. It involves reaching above my head, but I figure it’s weight bearing exercise. I have a Louet s90, out of production wheel. I like it because it folds down and I can use one, either or two feet, which is what i most often do. I find that when beginning a new bobbin, it helps to load the bobbin a bit, with yarn or leave some yarn you’ve already spun, on the bobbin. I have several old wheels, none of which have all the parts working, sadly, but would like to have another type of wheel, with a double drive. A woolee winder might be fun, too, if you keep the wheel. Woolee Winder is a flyer without hooks, so you don’t have to keep moving the yarn down the line of hooks to fill the bobbin. One company makes them for all kinds of wheels. On the side of the flyer is a slot, and an eyelet, which the yarn runs through as you spin it, goes back and forth on the flyer, so it lays the spun yarn down for you all along the bobbin, evenly. It’s beautiful wheel! I was on the same road. I was tried spindle for about a month, than buy a spinning wheel! I wish I got a chance to spin with your wheel. It looks so handsome! And your first yarn looks much better than mine ; ) I like the purple color I bet it will come out really beautiful yarn. I still have my first yarn scrap with me. It feels like sort of charm for me. Every time I fail on something, I saw it and I feel better because I’ll get better. I don’t know this is helpful or not, but think twice about what will be your main project for future. I love sock and lace weight, and I want make some silk yarn, but I find out my wheel has limited ratio (maximum is 1:20) so It’s doable but not that fast as I wanted. People say it is good to have first wheel, and you will outgrow in some point, but I can’t believe after few months of dating with my first wheel, now I am looking for another one! Hope you can find your long term boyfriend soon :D! you’re definitively becoming a spinner, it might be very hard to choose between knitting and spinning now!!! I don’t have enough time for it all.